Advances in surgical practice have always depended upon the introduction of enabling technologies. In the mid 19th century, the introduction of anaesthesia enabled surgeons to develop procedures to remove diseased or damaged tissues. In the mid 20th century, the advent of antibiotics and greater understanding of biocompatibility issues allowed surgeons to replace damaged tissues; the introduction of immunosuppressive therapies extended this technology to transplantation of whole organs. In the latter years of the 20th century, advances in computer and imaging technologies provided the tools needed to develop endoscopic interventions. These enabled surgeons to remove diseased tissues with less collateral damage and begin to repair damaged tissues in situ. The 21st century has seen the nascence of stem cell technologies. Surgeons are now seeking ways to employ stem cells to regenerate damaged tissues. At each step in this surgical journey, the enabling technologies have been exponentially more complex and sophisticated. Where surgery of the 19th and 20th centuries may have been viewed as a craft specialty, development of surgical practice in the 21st century surgery will necessitate the translation of tissue engineering, synthetic biology, materials science and computer assisted technologies into the operating environment. This can only be achieved if biologists, engineers, computer scientists and surgeons are brought together to share their skills. Unlike genetically modified foods, the public broadly welcomes stem cell technology and patients’ requests for stem cell treatments are increasing. Imam and Snow provide a much-needed insight into the development of stem cell technology and the potential role of stem cell expansion in the regeneration of damaged and deficient musculoskeletal tissues. The authors explain where stem cells come from, what makes them special, how they can be made to multiply and be influenced to differentiate into different tissues. In contrast to the public demand for stem cell treatments, legislative and governance bodies have struggled to create an ethical framework for the investigation, development and clinical introduction of stem cell treatments. The authors explain these challenges and the varying constraints on the development of this technology around the world. Imam and Snow provide us with a snapshot of current progress in the application of stem cell expansion across the spectrum of musculoskeletal medicine. In addition to work on the use of stem cells in the treatment of non-unions and bone defects, they explore the potential for articular cartilage regeneration, repair of tendon injuries, the treatment of degenerative joint disease, revascularization of bone and regeneration of damaged nerves. In this rapidly evolving field, Imam and Snow have provided an invaluable explanation and record of the first applications of stem cell technology in musculoskeletal healthcare. The book should prove to be a landmark in orthopaedic history and an inspiration to young scientists and surgeons alike. Mesenchymal Stem Cells in the form of expanded stem cells are believed to have multipotent plasticity. The expanded stem cells are capable of being differentiated into various cell lineages such as cartilage, bone, tendon, muscle, and nerve. These unique purported properties can play a significant role in the repair and regeneration of various tissues across a number of orthopaedic specialties. Bone marrow is regarded as the most used source of Mesenchymal Stem Cells in orthopaedic surgery and historically many surgeons have utilised unprocessed Bone Marrow Aspirate, in attempt to stimulate healing. The main concern in using Bone Marrow Aspirate to stimulate tissue repair/regeneration is the low concentration of stem cells found within it. To address this issue, various protocols have been developed to concentrate the nucleated cell numbers to produce Bone Marrow Aspirate Concentrate. The concept of Bone Marrow Aspirate Concentrate is to improve the recovery of the nucleated cells from the marrow aspirate, while decreasing the recovery of non-nucleated cells such as RBCs. 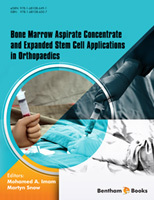 This book aims to examine the current reported clinical applications of bone marrow aspirate concentrate and expanded stem cells and their effectiveness in orthopaedic surgery.